Spending money on your blog for the very first time can be scary. Trust me, I know. When you’re still a beginner and totally new at the whole blogging thing, you might not be ready to dish out money just yet. But one thing I’ve learned is that there are certain investments that are worthwhile and can help propel your blog into the dream business you’ve always wanted. Whether you’re new or been at it for a while, there are blogging investments out there that can definitely benefit you. They help set you apart & reach an even wider audience. Let’s make this year YOUR year to turn your passion into profits. The year you finally start making money from your blog & see the power of entrepreneurship. So in this post, we’re talking 10 blogging investments that can take your blog to the next level. One of the first blogging investments I’m sharing is a domain name. I feel like this is super essential and incredibly professional. The name you choose will create your brand for your blog. It’s what you will be known as. It’s very important to think carefully about what you want your domain name to be that way you don’t have to rebrand it and change it later. Buying a domain name is actually a pretty small investment. You can find domain names on NameCheap for as low as 88 cents! It’s pretty cheap and then you just need to renew it every year (most likely at a higher price, but just read the terms of the site you choose to buy from. My domain name costs $15/year.) Optionally, you can add on domain name protection which keeps your information private when people look up who owns the domain. Hosting is just as huge as a domain name. So if you’re ready to make the next big step in your blogging business, it’s going self-hosted. That means that you own your website. Basically, if something were ever to happen to WordPress — your website cannot be shut down. Besides that, without self-hosted WordPress, you can’t easily customize your blog design. I have my website hosted with Siteground. They’re amazing & they have incredible customer service. You can get web hosting with them for just $3.95/month. You can make your blog look super beautiful and professional with a good premium WordPress theme. And don’t worry. You DON’T have to shell out big money for one either. Depending on your budget, there are themes out there for all price ranges. My first WordPress theme came from Etsy and it cost me a flat $25 which is not bad at all. I definitely recommend that you check out Etsy and Creative Market and shop around for a theme that fits both your needs and doesn’t break the bank. My current theme is by Bluchic and goes for $79. While you don’t have to spend that much, I do think this theme is much more functional & customizable than my original $25 one. But again, it’s totally up to you! Next up is Tailwind. Oh how much I LOVE Tailwind. Pinterest is one of my biggest drivers of traffic to my website. I absolutely love using the platform to share my content, but it can be time-consuming to constantly be pinning. That’s where Tailwind comes in. Tailwind basically puts my Pinterest account on autopilot. I go in, fill up a queue of pins I want to share and let it run. It’s very low maintenance. I just have to go in about once or twice a month and fill up my queue again. Besides the convenience of Tailwind pinning for me, it also gives me access to another traffic source I can tap into — Tailwind Tribes & Tailwind SmartLoop. Both of these are features that come with Tailwind that allow you to share your pins with people in groups and loop your content over and over again. And these features have given me an extra boost in traffic every month. Tailwind costs $15/month and you can get your first month free with my referral link! And besides Pinterest… You can also get Tailwind for Instagram. If you want something you can set up & let run for your IG too, check out this post about Tailwind for Instagram. Okay, Tasty Pins is something I only recently started using. 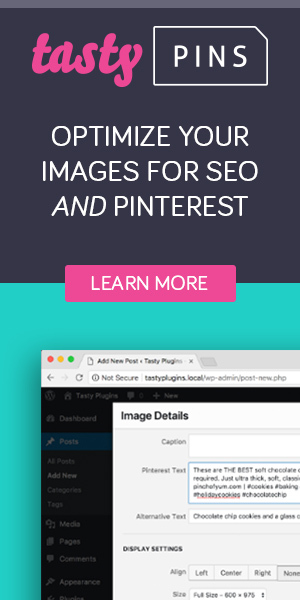 It’s a WordPress plugin that helps boost your Pinterest SEO. I’ve only been using it since December and I’ve already increased my traffic from last month. Tasty Pins essentially helps you add Pinterest descriptions to your pins on your blog, helps you add alt text to your pins, lets you hide Pinterest graphics from your posts, disable pinning on certain images and much much more. Before, when someone pinned a graphic from my blog, it’d just grab the title of the post as the pin description. Now, when someone pins a graphic, it takes a description I’ve crafted myself! So now when people shared my content, it is ALWAYS optimized for Pinterest & SEO. It takes the keywords & hashtags with it and allows people to share it with that text. I lovelovelove this plugin and I wish I started using it earlier. I’m currently working on going back to my old posts, updating my pins, and adding pin descriptions with Tasty Pins because it’s just that good. If you want to see Tasty Pins in action, try to pin one of my graphics at the bottom of this post and see for yourself! Landing pages are super essential for growing your blog into a full-time business. A landing page is a page on your blog that has a specific goal in mind. And that’s to convert your visitors into leads & customers. I love using landing pages to grow my email list! Here’s a peek at how I use landing pages for my free email course 5 Days To Pinterest Success. The page focuses on 5DPS and nothing else. No distractions. I use Bluchic Landing Page templates to help me create pages like this. I even used them to help me design my homepage & work with me page! The templates are super easy to use and create beautiful pages that I most likely couldn’t have created on my own. The landing page templates go for $109 so they’re a bit on the pricier side BUT the results are well worth it. You get soooo many templates for the price. Check out this entire post on Bluchic Landing Page templates! If you’re not a pro at graphic design but you know you need to be on Pinterest, then Pinterest templates might just be the blogging investment you need to make. Templates help you create beautiful pins for Pinterest by allowing you to change out the photos, fonts, and text to match your branding. Whether you use Canva, Photoshop, or something else, you can definitely find Pinterest templates for whichever program you want to use. You can find Pinterest templates in my own shop for just $18 for a set of 10. Or you can head to Etsy or Creative Market and find even more templates similarly priced. Okay, so one of my fav blogging investments has definitely been an email marketing platform. I love MailerLite for sure to help me manage my email list. You may have heard of other options out there like ConvertKit, Mailchimp, etc. I decided to go with MailerLite because it’s free up to 1,000 subscribers. It was perfect for me when I was just starting out and had 0 people on my email list. Because it’s free, it technically isn’t an investment of money (though down the line if you surpass 1,000 subscribers, it’s just a simple $15/month!) but it’s more of an investment of time. Email lists are so important and are one of the key ways of making money from your blog. When you create an email list, you are setting up a way to get access directly into someone’s inbox. And this is an awesome way to eventually sell to your email list! It’ll allow people to get access to valuable content from you, stay up to date on the blog and much more. It’s an investment of time because you do need to take time to create newsletters and opt-in freebies to start getting people on your list in the first place. Don’t overlook email marketing! It’s pretty magical. Are you a pen and paper kinda gal? I’m a bit of both actually. So I decided to invest in a planner made specifically for girl bosses like me… because regular planners just weren’t cutting it. My biz life has never been more organized than it has with The Content Planner. It’s bigger than your average planner and is completely designed with the female entrepreneur in mind. It’s got sections for your dreams, your goals, your Instagram strategy, your blog content, hashtag planning, collabs, and much more. I seriously love The Content Planner because it lets me plan out my business strategies on paper and allows me to track my progress. I’m just so obsessed with planners!! More than ANYTHING. More than anything on this list… you need to invest in yourself. I mean it. It might sound cheesy and lame to say, but it’s the truth. You need to invest in yourself always. Whether it’s investing time to care for yourself, relax and put yourself as #1 or investing money — you need to do it. I’ve invested in myself by taking online courses to teach myself new skills and it’s always been helpful. Blogging is not an overnight success. You won’t get rich in a day. Trust me. So it’s important to spend time learning and devoting yourself to the goal. Starting a blog can be a stressful journey, but don’t let yourself & your mental health take a backseat. Take care of yourself, invest in what you need to, and take things day by day.